Did you know that September is National Family Meals Month? It is a great time learn the importance of family dinner and to celebrate the benefits of eating together as a family. It is also a great time to commit to making family dinners part of your family routine. This post is sponsored by The Billion Family Dinners Challenge, which calls for busy Americans to re-connect at mealtime, but the opinions expressed are my own. Eating as family is so much more than just eating- it is time for family bonding. The benefits of family time are many and a family dinner is the perfect time to come together on a consistent basis. Shared family meals means you talk to each other, you look each other in the eye, and hopefully, you are thankful together for the shared meal and shared time. Shared family dinners is something that becomes easy the more you do it. I know that it seems like chess club, flag football practice, and piano lessons can sometimes get in the way but when you remember the importance of family dinner, it will be easier to make it happen. Shared family dinners show a high correlation to children that eat more fruits and veggies, are more willing to try new foods, and are less likely to be overweight. But that is not all, studies have shown that kids who eat with their families frequently are less likely to get depressed, consider suicide, or to develop an eating disorder, according to health.com. Wow. Are these correlations making you think you could probably fit in a shared family meal a few more nights a week? There are even more reasons to share a meal together as a family- doing so at least five times a week drastically lowers a teen’s chance of smoking, drinking, and using drugs (CASA Report). School performance tends to go up and divorce rates tend to be lower in families that eat together. As you can see, there really are plenty of benefits of eating together as a family. Now that you know the importance of family dinner, don’t you just want to let others know too? 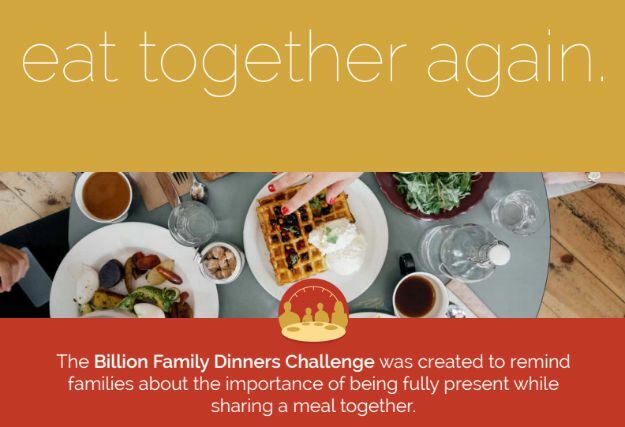 The Billion Family Dinners Challenge is about uniting to remind the world to have more family dinners. It is about showing that connecting over a shared meal can bring more love, compassion, and wellness into our communities! The movement aims to bring people together by challenging families nationwide to achieve one billion shared meals. How? By example! Just download the free DinnerCall App (available through the Apple App Store or Google Play Store) and use it to track family dinners and share experiences with the hashtag #BillionDinners. The DinnerCall app allows participants to upload images from family dinner to instantly share on social media, track other family dinners in progress and enjoy helpful dinner conversation starters. The free DinnerCall App uses cutting edge technology to bring awareness to this mission and to inspire the world to share more family meals together. The more that everyone uses the app and shares their experiences, the more we will inspire change and sharing more family dinners together is a great goal to share. To join in tracking 10 Family Dinners in 2 weeks, take the #billiondinners challenge today! The 10 in 2 challenge is simple: sit down to 10 family meals in the next 2 weeks. In just 10 meals, you’ll begin to see a difference. In just 10 meals, eating as family will be something your family looks forward to each night. Learn more at The Billion Family Dinners Challenge. Did you already know the importance family dinner? Do you think you will try to eating as family more often? This is great!!! My family and I need to try this! Very cool! I did not know this about September. Unless something crazy is happening, we always eat dinner as a family. It’s important to my husband and I to instill this into our boys. I know as they get older and get involved in more stuff, the dinner hour won’t be as “sacred” as it is now…but it is such a nice part of my day…and one of the reason I favor such simple recipes. I have long been an advocate of the family dinner. I was one of only few of my friends who ate with her family and our family has kept that tradition alive too. Well, you’re preaching to the choir on family dinners. I soooo believe in this. Great idea. Great campaign.